Excalibur Screwbolts unveils its next generation twin helix threaded anchor at the UK's largest tunnelling and excavation event. The Excalibur Screwbolt PLUS The latest addition to the market-leading Excalibur Screwbolt range will receive its first public presentation at UK's largest tunnelling and excavation event (BTS 2013) on October 23-24 at the Queen Elizabeth II Conference Centre in London. Like the original Screwbolt, which won a Queen's Award for innovation in 2009, the Screwbolt PLUS provides a simple and secure method of anchoring into even the toughest substrate – such as concrete - without the need for additional fixings, resins or special tools. Whilst the original design used standard commercial plating, the Screwbolt PLUS uses a unique "patent pending" surface protection system which greatly increases its resistance to corrosion. This high level of corrosion resistance (N.S.S. 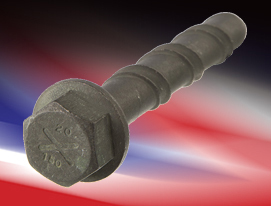 tests exceeded 6,000hrs) makes the Screwbolt PLUS a cost effective alternative to stainless steel anchor bolts. Visitors to BTS 2013 can see the Screwbolt PLUS, register for samples and discuss its many potential cost saving applications with Excalibur’s staff. Those who are unable to attend the show can contact Excalibur directly for more information. "After working on this exciting new development for two years we can't wait to give the Screwbolt PLUS its first public outing. The team here have come up with a pioneering product that rivals stainless steel for durability but with a much more affordable price tag." "What made the original Excalibur Screwbolt such a success was our motto of 'drill, fit and forget' it's easy to fix and it's extremely reliable. Screwbolt PLUS takes that principle to the next level and we're delighted with the result." "We've already had interest from major players in the tunnelling industry, so we're confident the Screwbolt PLUS will strengthen our reputation for innovation and performance."